According to writer Sid Fleischman, the spook show arose from the Great Depression as a way for movie theaters to “sell seats” at a time when movies usually weren’t played, usually after midnight. 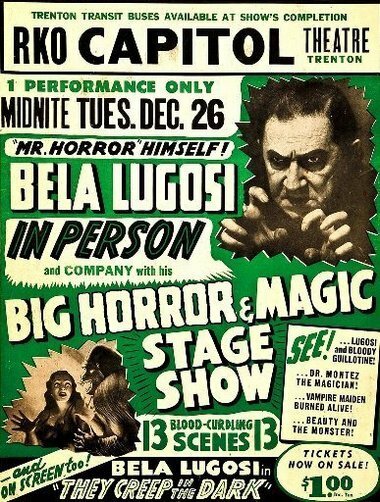 Spook shows usually consisted of someone performing spooky magic tricks, followed by a showing of a horror movie. After the film ended, the theater would “black out.” Scary sounds were heard while glowing bats and ghosts would fly around in the area, monsters would roam the aisles grabbing at people and various items would be thrown at the audience. In reality, the bats and ghosts were either projections, painted on fabric in luminous paint (held aloft on a wooden beam by hidden assistants) or glowing pictures painted onto balloons that were inflated and then released. Thrown items like string or puffed rice(!) were used to simulate spider webs and glowing ping pong balls were used to create glowing eyes. Do I even need to explain how the sound effects and monsters were created? Besides offering some Halloween-style fun, the black outs were also popular since they presented a socially acceptable way for teen couples to grab at each other in the dark. I used to do spook shows, and am currently investing in producing a permanent “spirit theatre” show. Thanks for posting! 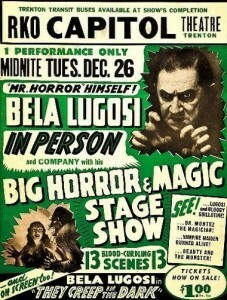 Please feel free to share more details about your old spook shows (and your “spirit theatre” project). time passes…my project cannot get off the ground in this area, no one will have it ,YET!.. I will change that. I feel the idea is a WINNER and I am going to make it work somewheres!! Halloween I have plans at last and probably final.